Until Next Time, and then "To Infinity and Beyond!" I used to hate saying "Goodbye! ", so I just stopped saying it. No point in making yourself feel bad by letting such a finality escape from your lips. We learned from our good friends Chris and Cherie (Technomadia) to think of parting with friends as "until next time", because there will be a next time, and a next time. 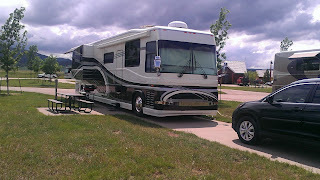 Since we bid adieu to Chris and Cherie we saw them in Melbourne, FL when we had our fuel "accident", and Sunday we will see them again, with roles reversed, in Billings, MT where they are currently residing until their Detroit Diesel 8V71 is made whole again. Saturday was an "until next time" day repeated over and over again as we walked the park repeating that phrase to old friends, and new friends alike. Our 7 day Newell Gurus Mini Rally was successful beyond our wildest dreams. 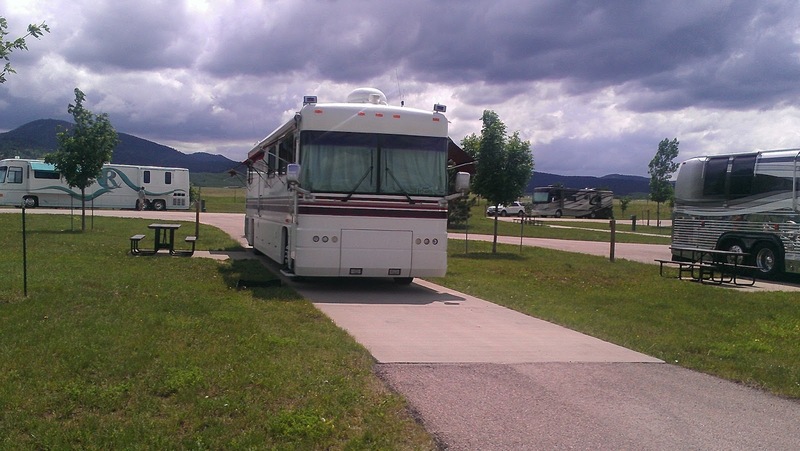 Many folks who put on RV rallies charge a fee to attend, which is above and beyond the cost for your individual RV site at the particular RV Park where the rally is being held. That attendance fee can range from a few hundred dollars to a couple thousand. We don't charge any additional fees. All you pay is for your site. You are responsible for making the reservation and getting you and your rig there. You don't even have to own a Newell to attend........all you have to do is show up and meet some amazingly cool people, and make new friends. There is no organization beyond a few scheduled potlucks and a few technical discussions.....and discussion is the key word....it's not a lecture, or seminar.......people sit down to discuss a particular topic with someone who is known to have particular expertise on that topic. There is no time limit...it's over when it's over.....you can stay the whole time, come in late, leave early, or not come at all. We have people who ask to attend who represent vendors such as Aqua Hot, or Gerard Awnings for example. We emphasize to these vendors that they are welcome, but our philosophy is "Friends Helping Friends", and that we don't charge our friends to help them. There is no monetary factor, or motive in what we do. That is why via word of mouth we had 31 different RV's attend our rally.....large by Newell standards, but small by say FMCA, or Escapee standards. We like the smaller rally. 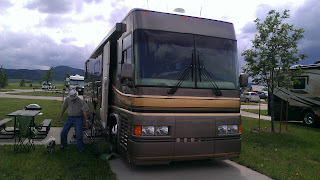 FMCA had over 3,000 RV's attend their rally a couple of weeks ago in Gillette, WY. With our format you are able to meet everyone, and actually remember all of their names. It is relaxed, informal and UNorganized....those who attend love the UNorganized part of it.....most, if not all of us are retired from the "organized" world. Our written in Jello goal was to depart Elkhorn Ridge RV Resort between 10 and 11 am, and we actually left at 10:15. As we edged on to I-90 westbound I was a little nervous, a consequence of the prior day's discovery of the 8 loose bolts on my drive shaft. Plus I was anxious to find out how effective the cleaning of my radiator was. In both cases I had nothing to worry about. The coach purred like a kitten all day, and in spite of numerous long 7-8% climbs she stayed cool and confident. When we arrived at Devil's Tower it was a zoo of people, RV's and cars.......we opted not to formally enter the park, even though we could have for free with our Golden Age passes. We, instead, parked briefly at the KOA parking area just outside the gate......took a few pictures, chatted a little, then did U-turns to escape the melee, and continued on our way back to I-90 via HWY 14. We all agreed that even without Devil's Tower as the goal, this drive was worth the detour.....it was beautiful!! 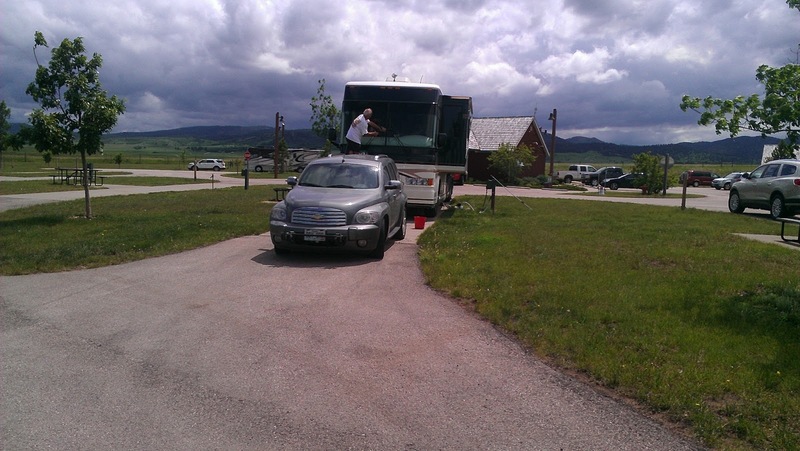 We arrived in Sheridan, WY at Peter D's RV Park around 4 pm......I had called on Thursday to reserve 3 spots, and the manager was outside as we arrived directing us quickly into three adjoining sites.....all just long enough for our 60+ foot rigs. Later, after it had cooled down, we all convened at our picnic table for a potluck.....what a nice group of people to travel with!!! We sat chatting, and enjoying great hamburgers, broccoli and carrots, and key lime pie until dusk. Another day lived well with good friends! This is our 3rd mini rally since 2009. At each of our prior mini rallies those of our number with exceptional wrenching (using tools to fix stuff) skills offer their services to other Newell owners (or for that matter, anyone in the park) who need help with fixing, or adjusting something on their coach. Richard Entrekin is one of those gentlemen among us with exceptional wrenching skills. You may recall TLE and I visited the Entrekins in Huntington, WV a couple of months ago, and during that time Richard helped me diagnose the problem with my tachometer. Since I got sick while we were there we were not able to complete the diagnosis, but had a good idea of the source of the problem. He promised to help me complete that work at the mini rally, and, of course, he is a man of his word. There are 8 bolts that fasten the crank shaft to the output end of the transmission connecting it to the differential which transfers power to the four rear drive tires. Every single one of those 8 bolts was loose, and several where near failure. My mind began to race as I imagined the catastrophic consequences of the drive shaft falling from the transmission linkage, hitting the ground at 60-65 mph, and then who knows what happens next......I'm seeing dollar signs with at least 5 digits after them.....I'm seeing us broken down on the side of the road somewhere just a few miles west of our current location......I had maybe 40-50 miles before the unthinkable would have (not might have) happened had not Richard looked at something else besides the signal generator for the speedometer. It's that unspoken fear we all have who own these expensive, complex machines.......we all fear a catastrophic breakdown, which is why we are always checking things....which is why we crawl under our coaches, or have someone qualified do so, on a regular basis. One of the 8 bolts....see how the threads have been obliterated? While I stood there in stunned disbelief that I had come right to the precipice of a bank account draining catastrophe, and but for the fact that I wanted to fix my speedometer I would not have known, in time, what was about to happen to me of such magnitude.......I would have been in the same place several of my friends have found themselves in the past 10 days. 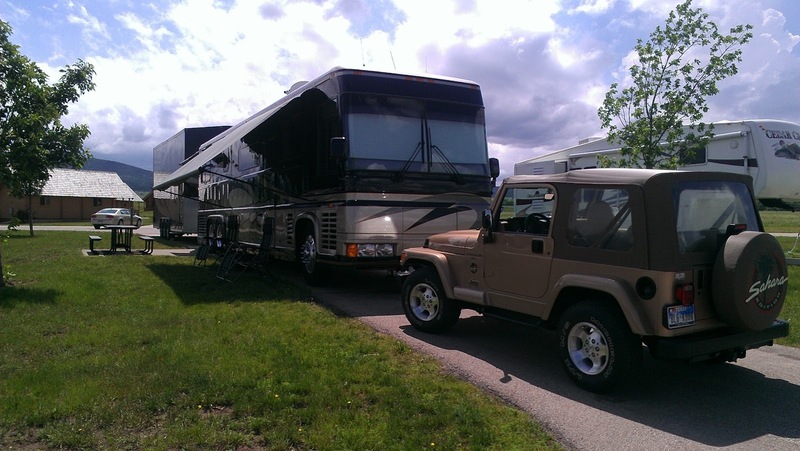 You remember me writing about Chris and Cherie's catastrophic engine failure in Montana that still has them in Billings, MT while their 8V71 Detroit Diesel is rebuilt. 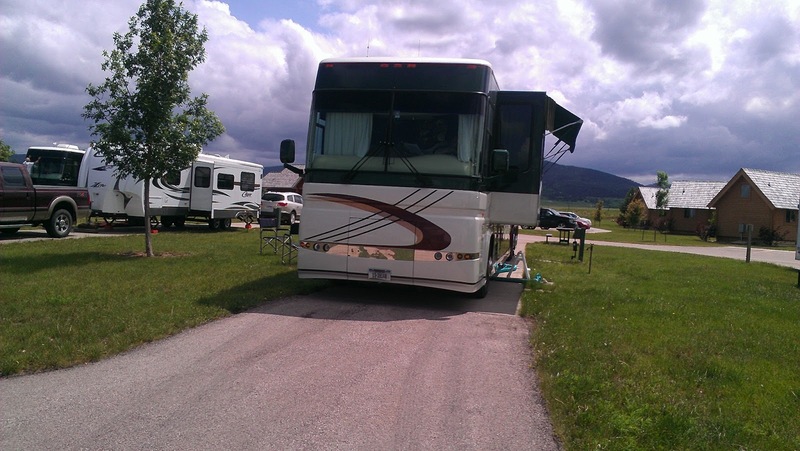 Or our friends Forrest and Mary Clark who left us just a few days ago, and broke down just southeast of Gillette, WY with a an air valve failure that left them with no air suspension, and unable to move forward. Their inconvenience was only 6 hours, but you get my drift.....they, too, were broken down on the side of the road just on the edge of spotty cell service. They got their problem fixed, but at some cost. Richard's keen observation skills saved me thousands of dollars, and I will be forever indebted to him.......what do 8 bolts, and 8 top locking nuts cost, you might ask......$6.57.....I would have gladly paid 100 times that cost for those 8 precious bolts that will save me from this disaster. Are other problems lurking out there I don't yet know about? I hope not.....but at night when TLE is sleeping I wonder when my turn is coming. Of course, when we lived in a sticks and bricks home I thought the same thing.....when is the air conditioner going to break, or the furnace, or the roof leak......costly problems are always lurking out there, even in a sticks and bricks home.....did that keep me from being a homeowner.....of course not! And it will not keep me from being a motor coach owner. If the worst happens TLE and I will deal with it, and move on....do I want to "deal with it"? Of course not! ......a broken drive "tang".....well I can't find that part at Fastenal....it is 1.25" long, but will take me the rest of the afternoon to source a replacement (and I did find a source, but now have to wait until I am someplace for a few days to receive the package). We also were able to remove the right angle tachometer drive and found the reason my tachometer was not working. That will also require a little research to find a new right angle drive....BUT at least I know what I'm dealing with now, and can eventually get the replacement parts and install them myself....YAY!! While Richard was helping me others were helping Tom McCloud fix his front basement A/C which had stopped working a few times.....it appears they, too, were successful. 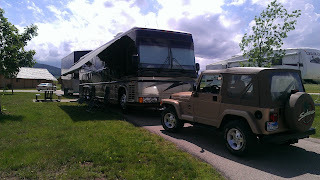 There were other Newell owners helping other Newell owners all over the park.......it was a great "Wrenching" day. Saturday many of us will again begin to roll our wheels towards new adventures, so Friday night we had our 3rd and final potluck dinner at 6 pm....it was closing in on 8:30 before we began to disband and move back to our coaches where we each would begin our departure preparations. It has been a wonderful week full of renewed friendships, and new friendships that will continue to grow over the months and years to come. There will be another Newell Gurus Mini Rally......when? Who knows....we are not that organized, but when the time comes we will know it, and we will gather together again in a wonderful location and do it all over again. 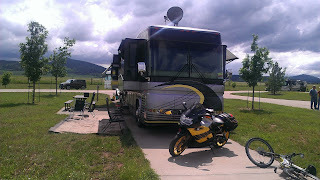 We have done very little site seeing since we arrived here in Spearfish. We have spent a lot of time visiting with, and getting to know fellow Newell owners, as well as helping fix things, install things, etc. However, we had set Thursday aside to travel to a few local sites. At past Rallys we have usually spent time with Tom and Darlene McCloud site seeing, and this rally is no different. Tom approached me on Monday about what days we would like to get out and see some of the local sites. Initially we had agreed to go and drive Spearfish Canyon on Tuesday, then on Thursday head over to see Mt. Rushmore. Well, Tuesday ended up being a day I helped Todd begin the installation of his satellite dish. Originally I had thought I would work on his dish in the morning, then go do the driving tour of Spearfish Canyon, however, I had more than a normal amount of insurance stuff to catch up on, and did not get to Todd's coach until early afternoon, which is when we were going to go driving. I stayed home and worked on Todd's satellite dish, but TLE went with Tom and Darlene. Since our Thursday jaunt was to be an all day event I scheduled nothing else to be sure nothing would interfere with the day. I don't know about you, but I have always wanted to see Mt. Rushmore.......well, ever since I saw the 1959 Alfred Hitchcock movie "North By Northwest" starring Cary Grant and Eva Marie Saint in which Mt. Rushmore, and the surrounding environs had a prominent roll. We departed Elkhorn Ridge around 10:15 am headed for our initial destination of the day, Keystone, SD. Keystone is just a few miles from Mt. Rushmore, but houses a museum dedicated to the sculptor, Gutson Borglum, the son of Danish immigrants, who conceived, and "built" this memorial dedicated to the miracle we call the United States of America, honoring George Washington, Thomas Jefferson, Teddy Roosevelt, and Abraham Lincoln. No pictures are allowed inside the museum. The drive to Keystone from Spearfish is about 62 miles. The weather Thursday was just gorgeous, and the drive was uneventful. Keystone is a town basically dedicated to tourists who come to visit Mt. Rushmore, and the other numerous touristy attractions in the area, and they are numerous, but our only reason for being in the area was to see Mt. Rushmore, and drive through and around Custer State Park. Of course there are the usual souvenir shops replete with everything "Rushmore". When we arrived it was after 11:30, and by the time we located suitable parking it was time for a little nourishment, so we headed over to a local pizza place with outdoor dining (the McClouds had their sweet dog Missy with them) where we all got the "Pizza Combo" (slice of pizza and a drink) for $4.50. It was delicious stuffed pizza, and really hit the spot. Once we were properly fortified with nourishment we walked the short distance over to the Borglum Historical Center where we were each separated from a $5 bill to do the "half" tour....of course the full tour is $10, just like about everything else we would see this day. We watched a movie about Gutzon Borglum and his life as a sculptor. It is about 23 minutes long, and I recommend seeing it before you go to Mt. Rushmore, but you can do it in any order that pleases you, or not see it at all. I just think the movie gives one perspective for the actual monument. In addition to the short movie there is a sort of pictorial museum, and a number of sculptures Gutzon Borglum created in his lifetime. Abraham Lincoln was his favorite President, and he did numerous sculptures of Lincoln, as well as naming his son Lincoln. From Keystone it is a short 3 miles to this National Monument......you are driving along seeing signs that say you are almost there when suddenly you turn a corner and there it is. We're as good lookin' as those guys, are we? There are absolutely no dogs allowed in the Memorial so Tom stayed with Missy at the car....he had been here years before.....so Darlene, TLE and I headed up to see this amazing sculpture that was carved out of a mountain so many, many years ago. Our timing was perfect in that we arrived just as a naturalization ceremony was beginning. What a cool place to take your citizenship oath! We walked around, visited the museum dedicated to the construction of this massive sculpture, and took a boatload of pictures. Next up on our list of things to do was to drive over to the Crazy Horse Monument, the brainchild of Korczak Ziolkowski......it has a long, long way to go, and the only thing you can really see is the head of Crazy Horse......there is not much else about this massive sculpture that is recognizable, but it is obvious that a lot of rock has been moved. It was getting late in the day, and we still had a long site seeing drive we wanted to take through Custer State Park, and particularly the Needles Highway, so when we saw it was going to cost us another $40 to get in we opted out. No doubt when this sculpture is done it will be amazing.....just the work done on the head is amazing. We then headed over to the entrance to Custer State Park where we were again separated from another $15 for our car to enter the park....by this time it was after 3 and we were ready for a snack, so after paying our entry fee we headed over to the park store to get some ice cream cones. We enjoyed sitting in the shade eating our cones, and joking around like we always do. Then it was time to start our drive on the Needles Highway. What a beautiful highway replete with numerous rock tunnels mostly one lane wide, and breathtaking views of rock formations. These 4 pictures taken by TLE.....very nice! The Needles Highway drive is a must, and we are so glad we took the time to make this drive. We arrived home around 7:30 pm with smiles of satisfaction on our collective faces. It was a good day spent with good friends seeing some amazing scenery including the iconic Mt. Rushmore. A friend of mine posted a few days ago that they had lost power this past Monday in their neighborhood in northern Indiana. They have a small gas generator they put into service when something like this happens, but it is not big enough to power their air conditioning.....just the basics like lighting, refrigerators, TV, computer, maybe the sump pump if needed, etc. He observed that over the subsequent 3 days without city power (power was just restored Wednesday evening) they spent more time outside in the early evening where there was a breeze and it was cooler. As a result they spent a lot of time talking with their neighbors. His observation is that with the advent of air conditioning we spend more time inside where it is comfortable, and almost no time interacting with their neighbors. Years ago before air conditioning in homes became the standard we all spent time sitting on the front porch of our homes sipping a cool drink and visiting with passing neighbors, or we walked around our neighborhoods talking with other neighbors. While I know we can all agree that air conditioning is something we do not want to be without, especially on those hot summer days and evenings, the unintended consequence of that modern convenience, which we now take so for granted, is we don't know what is going on in our neighborhoods anymore. It is easier to sit inside being comfortable in the wonderful air conditioning. "This lifestyle" TLE and I have chosen to embrace has had the opposite effect of air conditioning. We tend to spend a lot more time outside our "home" walking around our "neighborhood" than we did before we moved into our coach. The unexpected result of this lifestyle choice is we meet people we would never, ever have met before. Not just because we spend time outside our "home", but because we keep moving our home, and changing our view. We find ourselves in new neighborhoods and want to get out and see what's happening. The natural result of this lifestyle is that you spend more time outside, and you spend more time talking with your neighbors. We strike up conversations with people in Walmart parking lots, in Lowe's parking lots, in Cracker Barrel parking lots, in RV parks. A great example of this phenomenon was when we were in Hammond, IN a few weeks ago. I was outside in the Walmart parking lot cleaning the residue of the rain storm from the day before off my aluminum wheels for about a hour. No, it didn't take me an hour to clean the wheels.......there were three conversations with passing strangers during that hour....cleaning the wheels took about 10 minutes, but the conversations lasted over 45 minutes. I met a gentleman who had just purchased an RV and was thinking about traveling full time. He had lots of questions. 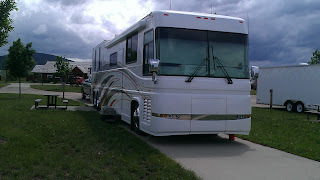 Then another couple (husband and wife) pulled up and began inquiring about our coach, and our lifestyle. 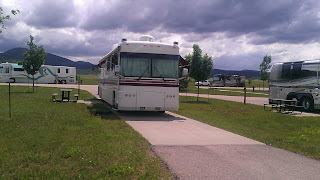 Then a third person, a young lady, stopped to talk about our lifestyle.....she was thinking about making a change in her life and was exploring the possibility of living full time in an RV and traveling while she worked. Sometimes I feel like our journey has turned into sort of a ministry where we preach the gospel of unfettered living, changing your view on regular basis, and having plans written in jello to all that will stop and inquire. We don't always stay in the moment eschewing the desire to plan everything out.....sometimes we are frail and want to know what is coming around the corner, or make a reservation, but most of the time we are true to our goal of living day to day and letting tomorrow take care of itself. When we are able to stay in the moment, in the day, we are so much happier, and so much more open to serendipity. There are days when we wish everyone would, or could share what we are experiencing, but the reality is if that happened it would get very, very crowded out here. This Newell Gurus Mini Rally we are a part of is a great example of the blessings of this lifestyle......Wednesday in particular. We started off the day taking a tandem ride for about 13 miles with our friends the Entrekin's who also have a tandem. When we returned we went and spent time with our friends the Day's whom hadn't seen in 17 months. Then we sat talking with our new friend, and current neighbor, Chester Stone. Later in the afternoon I spent time with the Flickema's helping Todd finish the installation of the satellite dish we began installing the day before. Around 6 pm we headed over to the pool area for our second potluck dinner of this rally. 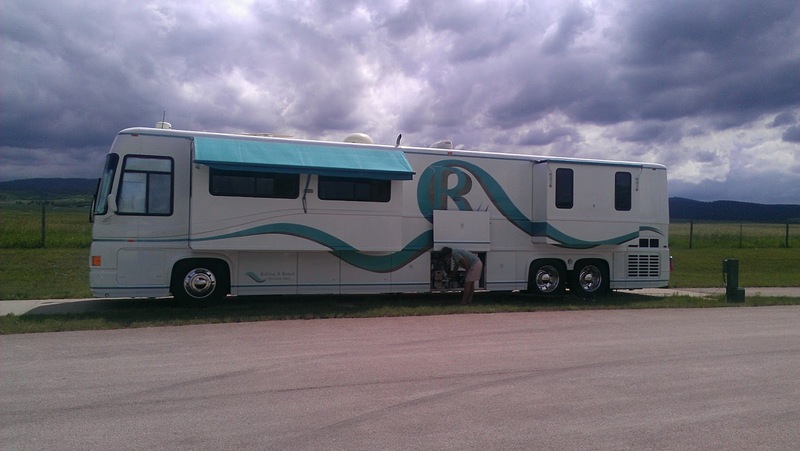 We spent time talking with Paul and Cheryl Nelson who own one of the rare 47 foot Newells. They also own, and operate a hunting lodge up in Gettysburg, SD. They are very interesting people, and have invited us to visit their lodge the next time we are in South Dakota. Then I spent about 30 minutes talking with Larry Brachfeld another Newell owner, and current neighbor. A very, very interesting guy. My point is in my prior "sticks and bricks" lifestyle I rarely visited with neighbors, or took time to engage in random conversations with strangers. Now my days are full of those events. In this process I have learned a lot about myself, and met a lot of interesting, wonderful people. In many cases those former strangers are now friends I stay in contact with, and because we all move around the country we continue to cross paths with them. Just Tuesday we crossed paths again with Forrest and Mary Clark whom we first met in Cedar Key back in January. They were on their way to Gillette, WY for an Escapees rally and decided to stop here in Spearfish to catch up with us for a couple of days. In the process they made some new friends, too. In my old life spending all this time conversing with people would have worn me out, but now it invigorates me in a way that is hard to describe.......it continually puts my life into perspective. When you sit inside your air conditioned home you tend to lose perspective. Your own problems, struggles, etc. get blown out of proportion. When you are outside talking with people you hear about their failures, their successes, their struggles, etc. and you realize your life is not so bad, or so good as you thought. In fact, you tend to stop thinking about yourself as much, and you tend to become more grateful for what you have, and less focused on what you don't have. This post was kind of wordy, and maybe a little preachy.......I hope it didn't come across that way. I just woke up today feeling so happy, and so blessed I had to share it with ya'll. As I wrote yesterday the wind came up around 5 pm accompanied by a little rain. The rain stopped pretty quickly, but the wind continued unabated all night long with sustained winds of 30-40 mph, and around dawn increasing to 50-60 mph. When you live in an RV this means the RV rocks, and rolls most of the night. That translates into fitful, interrupted sleep. Around 5 am TLE and I gave up trying to sleep anymore an just got up. It's amazing how a cup of rich, strong, freshly brewed coffee can elevate your spirits. Besides, there are always naps, right? TLE's nap came around 8 am when the wind stopped suddenly. For some reason, my nap never quite arrived. I had things to do, and people to see. The first order of business was to redeploy the main patio awning, plus the window awnings and sun screen. The winds had swept away all the clouds leaving bright, intense sunshine with temperatures in the pleasant range of the mid 70's. After creating some shade, I refilled my oil reservoir on the DD with one gallon of 40 weight. The oil reservoir holds about 3 gallons of oil at a time, and when I need to add oil, which is not too frequently, I just open a gate valve on the reservoir and let the appropriate amount of oil flow into the engine. I think the last time I filled it up was in Savannah, and we've used about 4 quarts of oil since then. The theme of our Newell Gurus website is "Friends Helping Friends", and that is what I did Tuesday afternoon. Our new friends, Todd and Dawn Flickema, want to add a crank up satellite dish to their coach, and since I did the same 5 years ago to my '82 I volunteered to help Todd make that a reality. He returned to his coach from Rapid City just after Noon time, and we got to work installing his new satellite dish. We did the same thing on his coach I did on mine 5 years ago....remove the Weingard Batwing, over the air antenna, and used the same hole in the roof to install the dish. While Todd removed the old batwing, I began to assemble the new satellite dish. Normally this project should/would take one to 1.5 hours, but there is always one thing that doubles the time, right? My son and I call it the Hockwald way, but all guys know what I'm talking about. Do it yourself projects always seem to take two times longer than they should. In this case since the dish is mounted on the center line of the roof where the sheets of riveted aluminum overlap you need a "shim" to make the entire mounting surface for the dish flat. There was a shim big enough for the old "batwing" antenna, but the foot print of the dish was about 2 inches bigger, so we had to make two additional shims by laminating 4 cut pieces of aluminum sheeting together to equal the thickness of the original batwing shim. I just happened to have a couple of 1' x 3' aluminum sheets which we used for this purpose. It took about an hour for the glue laminating the pieces together to dry sufficiently, so we took time to eat a lunch prepared by Todd's wife, Dawn. The shims I made worked out well, and the actual installation of the satellite dish went very quickly from that point. After securing and sealing the dish to the roof we decided to put off until Wednesday the installation of the hardware on the inside of the coach to make the dish operational. It was 3:30 by this time, and Tuesday night was our turn to open our coach for those in our rally who wanted to see the interior of a Newell Classic. TLE had spent time vacuuming, and cleaning the interior to put our best foot forward for our guests. We had a steady stream of folks dropping by including John Clark (and his wife Vicki) from the Newell Factory. John personally owns a 1987 Newell Classic, so he really appreciated the feel and look of our '82 Classic. We capped off a great day, and evening with a fire in our portable fireplace. Friends dropped by throughout the evening, and we ended the evening talking with the Flickema's and McClouds. There is just something about a fire that brings people together, and makes for interesting conversation. Day # 3 started out clear, windless, and warmish and ended windy, cold and rainy. In between I worked on a couple of projects. The first was installing a "cam bar door latch" on the passenger side door on the trailer. I have wanted, for some time, to add this additional security to this door. The other two ramp doors have two of these each, but this door had a rudimentary lock that could be compromised easily with a crow bar. Well, now it is secure also. Of course any "do it yourself" project requires, at the very least, two trips to the home improvement store (Ace Hardware affiliate - Knecht Home Center), and that is what was required of me for this project. It took a few hours to complete, but it turned out great. As I worked the temperature increased steadily to the point where I had to open the ramp door on the drivers side (above) to let air move through the trailer. In spite of that I was wiping sweat from my eyes all morning. As I worked coaches continued to arrive....I counted at least 3, or 4 during the the "latch" installation. After I finished admiring my work it was time for the guys I had hired to come and power wash my massive radiator. It has been almost a year since I last power washed it, and that cleaning job has held up well, but on the drive up from Sioux Falls I noticed the engine temps running about 5-6 degrees warmer than normal. The best time to take care of this is when you first starting noticing temperature increases, because it only gets harder to clean it later. As it turned out it took about 30 minutes of applying degreaser and power washing to sufficiently clean the radiator. Based on the amount of black gunk that ended up on the pavement under the radiator we (they) accomplished the mission. It was worth $40 to me not to have to get filthy. As I stood there watching the two young guys do the deed I also noticed them getting dirtier and dirtier. By the time they finished they had to go home and change clothes before they could go on to their next job......:-) When we visit our friends, Bog and Karen on Whidbey Island later in July I will make use of his power washer with heated water (250 degrees) to completely get all the gunk removed. Just as they finished I noticed our good friends Forrest and Mary Clark arriving in their new to them 1996 Foretravel. 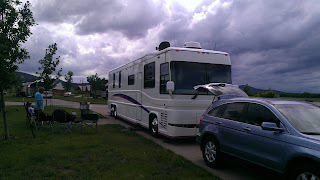 They are on their way to Gillette, WY to attend the Escapees RV rally, and decided to stop off and visit for a day. When we first met Forrest and Mary in Cedar Key last January they were in a 34' Class A gaser (gasoline powered). 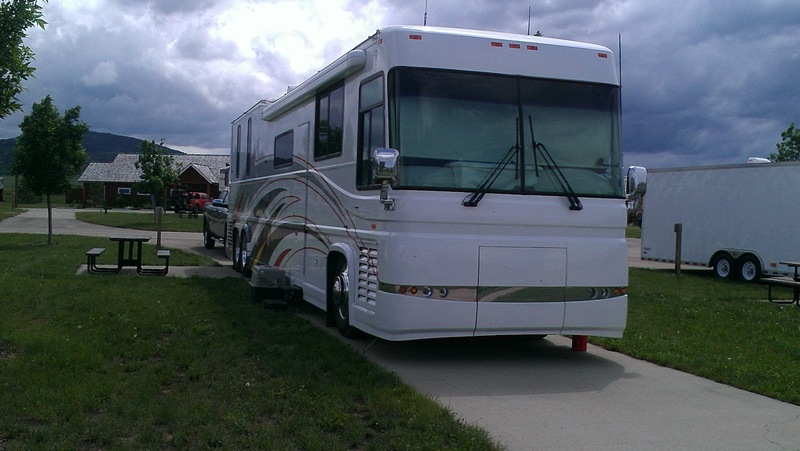 They had purchased it brand new in 2012, but were disappointed in how poorly it was standing up to travel and full time living. Forrest told me it was "literally falling apart around their ears" as they drove down the highway. After touring our coach and another Newell (Forest and Cindy Olivier's) that arrived in Cedar Key they decided they were going to trade their gaser in on an older well built coach. 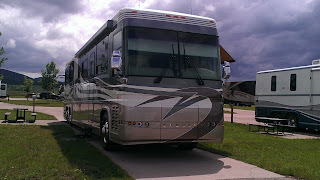 Ultimately that coach was the 1996 Foretravel they now live in, and they are very, very happy with the change. 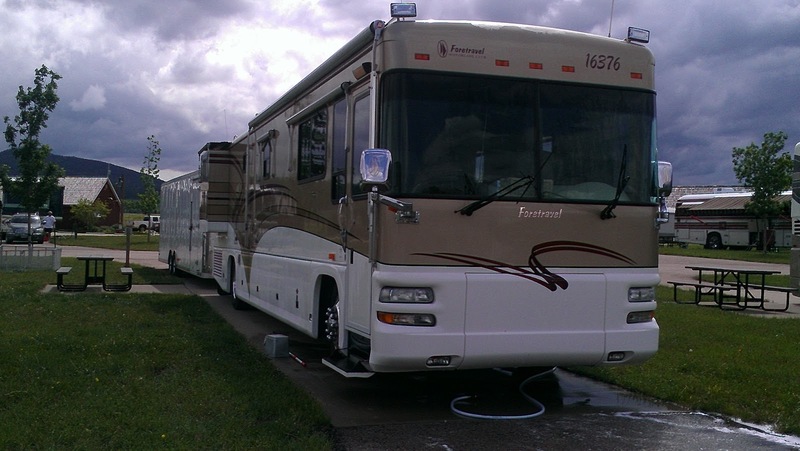 Foretravel is known industry wide for the quality they build into their coaches, and this coach is a fine example. A friend took this picture of my friend Richard Entriken, but I am posting it to show you Forrest's 1996 Foretravel in the background. Richard is building up a new tandem frame....why is an interesting story. You can see the dark skies lurking in the background of the above picture, and within 30 minutes we were all putting in our awnings as the wind picked up, and the rain came. The rain was short lived, but the winds continued all night gaining in ferocity as dawn approached. Finally, as I sit here writing, the winds have abated. They made sleep last night difficult as the coach rocked and rolled most of the night. Around 4 am as the velocity noticeably increased I got up and cranked down the satellite dish. We were supposed to do our first round of coach tours last night starting at 6 pm, but the wind and sporadic rain seriously dampened enthusiasm, however I saw a number of people leaning into the wind as they moved from coach to coach. Tuesday evening our coach will be open for touring. Of course, throughout the day people came by to talk, and as I walked around the park after my two projects were completed there were more conversations. We have a great group here, and we are so grateful we put this mini rally together. It, so far, has exceeded our expectations! To close out the evening I watched the Blackhawks vs. Bruins NHL game six. The 'Hawks were down 2-1 with 1:28 to go in the 3rd, and final period, when they managed to score 2 goals in less than 17 seconds to go up 3-2, and held on in a frenetic final minute of play to win their second Stanley Cup in four years. Congratulations to my friend Keith in Highland, IN who is a die hard 'Hawks fan. Wow.....Sunday was the complete opposite of Saturday. Balmy, cloudless, very slight breeze and no HAIL. Rally participants continued to pour into the park. I was talking to a new friend, Jimmy Webb, when I looked to my left and saw that our good friends David and Denise Zonker had arrived! They are only going to be able to be here two nights so after hugs had been exchanged we made plans to drive into Spearfish for lunch, and then go for a four mile hike up to Lookout Mountain (2 up and 2 down). It was around 10, and we would leave for town around 11:30 so I had to get hopping to finish up a few things before we could leave. 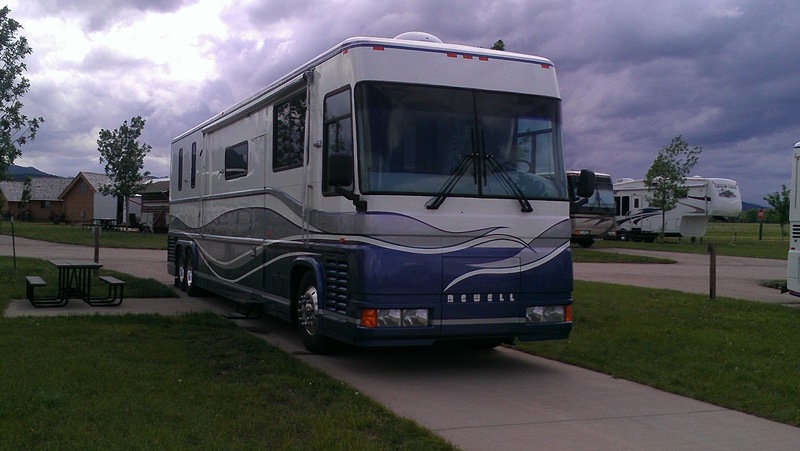 David and Denise used to own a Newell, and that is how we first met them, but a few years ago they sold it. They had bought it to tour the U.S. for a few years, and that phase of their retirement was over, and overseas travel was the next phase. Nevertheless, they did purchase a less expensive Class B motorhome so they could go out on the road and meet up with their Newell friends from time to time. It was in their Class B that we headed into town. More than one person had recommended that we eat at The Stadium Sports Grill and have their Beef Tips and Kettle Chips. I was the only one to order them, and they were amazing. We had a lovely lunch filled with conversation and laughter, and, of course, a brew, then headed out to the trail head, which was only a few blocks from the restaurant. All four of us are pretty fit, and the climb, while steep in places was a lot of fun, and not too hard. We reached the top....well within 100 feet of the top....in about 45 minutes, and enjoyed the view for a while before heading back down the hill. After returning to Elkhorn Ridge we spent the rest of the afternoon greeting new arrivals....our good friends the Entrekin's arrived shortly after we got back, and we spent time catching up with them. 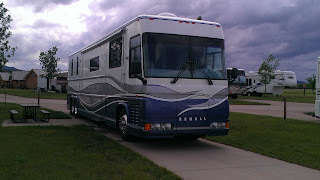 The Newell factory had sent one of their show coaches (2010 Newell) to the FMCA rally in Gillette, WY (about 3,000 RV's of all makes and types attended this rally), and they decided to have the drivers stop by Elkhorn Ridge RV Resort so those who were interested could tour it. It can be had for a mere $1.4 million. Here are a few pictures. Around 6 pm we all headed over to the pool area to have a potluck dinner, and see a slide presentation of the History of Newell presented by another good friend, Michael Day. We had around 50-60 people in attendance, and the food and dessert selections were delicious! On our way back to our coach after the festivities I saw the Super Moon just peaking over one of the Newell coaches.....a perfect end to a delightful day spent with good friends. 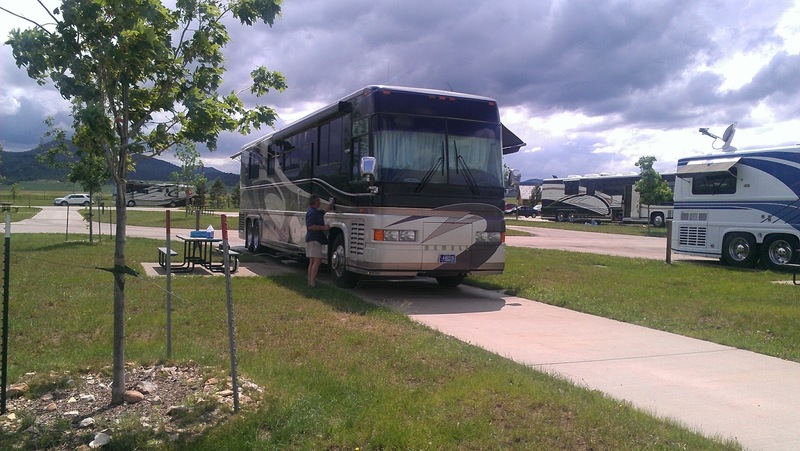 The idea for a "mini rally" in Spearfish, SD was originally conceived by my friend Todd Flickema and myself close to a year ago just after he had purchased his new to him 1984 Newell 40' coach. We had been talking on the phone, and exchanging e-mails for a while, and I was interested in meeting he and his family at some point. 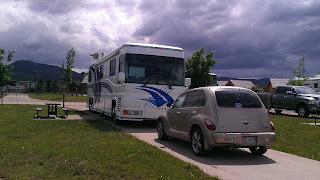 We knew we would be passing through this area in May, or June so we decided to hookup in Spearfish. I mentioned what we were planning on the Newell Gurus website and before you knew it we had about 5, or 6 more people interested in joining us. Todd graciously did all the leg work to locate a suitable park for us and the rest is history. We now expect to exceed 30 coaches at this "loosely organized" mini rally. Fortunately the group we have assembled here love the idea of "loosely organized".......most, if not all of us have retired from the "organized" world, and really don't like schedules, but are able to tolerate "loosely organized" ones. Since I took these pictures more coaches have come in and I will endeavor to photograph them for you and post them in tomorrow's blog offering. Saturday was mostly delightful weather.....partly cloudy, and almost no breeze. As coaches would arrive we would go out to great old friends, and new friends. Some we have not seen since 2009...the year of our last mini rally.....but it only seemed like a few months. In between coach arrivals those of us already on site were washing and detailing our coaches. I had to wash a 1200 miles of road grime, and rain off of mine....fortunately the work I did before we left Indianapolis made the cleaning easy, and I was done in less than 2 hours....and that included going up on the roof and washing it off also. While I was thus engaged TLE found a hairdresser in Spearfish and took off to have her hair cut. Just as I was finishing she returned......she found a good stylist......her hair looks wonderful, and she is happy.....which, in turn, means everyone in our coach is happy! Around 5 pm it began to get very dark and ominous, as well as very windy. I had just printed off something for Tom and was in the process of walking it over to him when Tom pointed behind me and said "GET YOUR AWNING IN QUICK!! "....I turned to see this wall of water coming at us, and felt the force of the wind pushing it. I handed the printed form to Tom and sprinted back yelling for TLE to help put in the patio awning, which was my main concern. We quickly got it down just as the wind really hit with the torrential rain. While TLE put in the rest of the window awnings I rushed inside to stow the satellite dish. We got a little wet, but got inside just as the monsoon hit......with it came heavy winds....probably in the 60 mph range with grape sized hail mixed in with the rain. There were hundreds of lightning flashes, and the coach began to rock back and forth. Within about 10 minutes the worst had passed, but the rain continued on for a couple of hours at a pretty hard, steady pace. We suffered minor damage to the roof vent on the trailer....well, actually, it looks like someone shot it with a shotgun. I just finished ordering a new one from Amazon Prime....it will be here Tuesday! During all of this our friends Todd and Dawn Flickema arrived.....nothing like setting up in the rain.....well they didn't....they opted to go to dinner, and returned after the rain had stopped, and then hooked up. I went over with Todd how to hook up the water, and which valves must be opened and closed. The Blackhawks were playing the Bruins in the NHL finals, so I watched most of that game....the 'Hawks ended up winning in regulation (for a change) 2-1. They are now ahead 3 games to 2 in the best of 7 series. That was the first day of the not so "mini rally".....thanks for stopping by! Two's Company......is Three a Crowd? Is it a "travel day" when you only move 11 miles?